Kanger Vola Starter Kit Review – Voila Vapor! 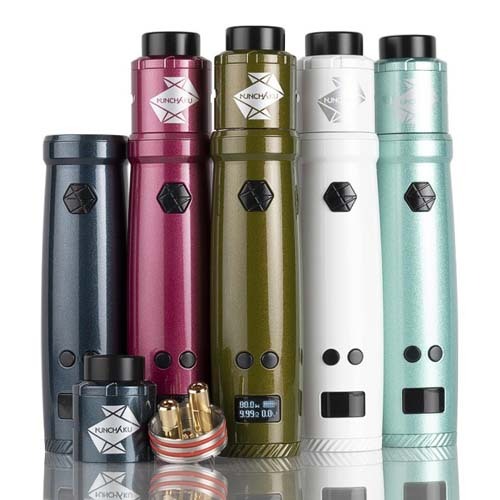 Kanger might not be the type of company that churns out mod after mod with little changes in between iterations., but whenever they release something new, it’s almost guaranteed to make an impact in the Vaping scene. 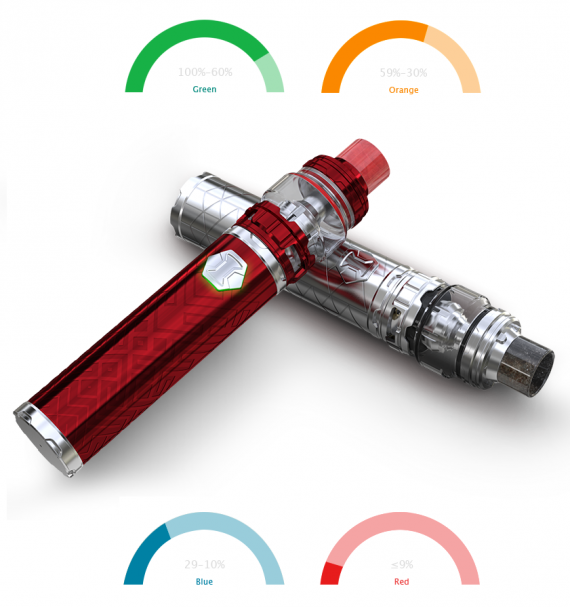 The Kanger Vola is a 100-watt device powered by an internal 2000mAh battery. Bundled with the Vola tank, the kit is geared for beginners and power users alike with its multiple UI modes which either simplify or extend the functionality of the kit. Upon first glance, you’d be hard-pressed to spot any differences between the Kanger Vola and any regular modern portable media player. 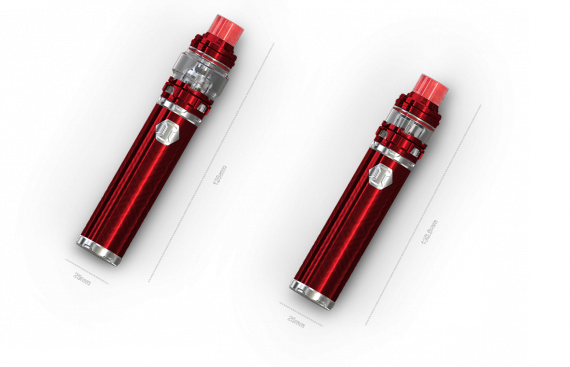 The simplified streamlined design hardly gives away it’s intended purpose as a Vaping device and makes the Kanger Vola look more like a fatter iPod. 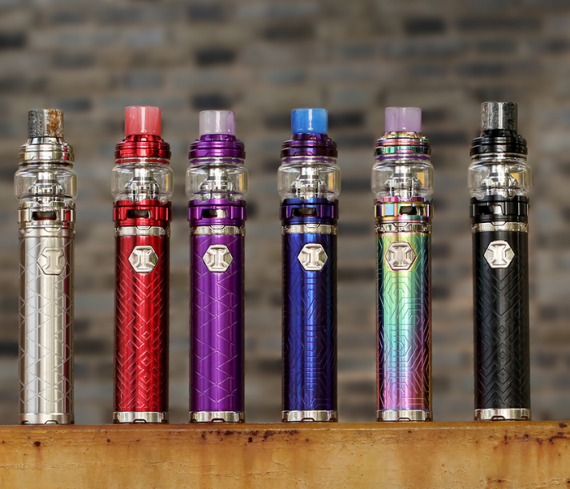 The zinc alloy side panels are available in a variety of colorways to choose from; from monochrome to an assortment of vibrant pastel colors that really pop out. The front and back panels are manufactured from a type of moulded plastic which is smooth to the touch and is more than a tad bit glossy which makes it a rather notorious fingerprint magnet, unfortunately. The 1.3 inch TFT color display does an acceptable job of conveying all important information regarding the status of the device, however, in an era where OLED displays are slowly becoming the norm, it’s slightly disappointing to see Kanger slightly cheap out on the screen of the Vola. Regardless, colors are still vivid enough with brightness and legibility being good enough for outdoor use. The side of the mod features the large round firing button which slightly protrudes from the body of the Kanger Vola making it relatively easy to find and actuate. The firing button is satisfyingly clicky offering a good sense of tactility whenever firing the mod. The up/down wattage buttons are found directly below the firing button and are similarly crisp to the touch making menu navigation feel far from a chore. 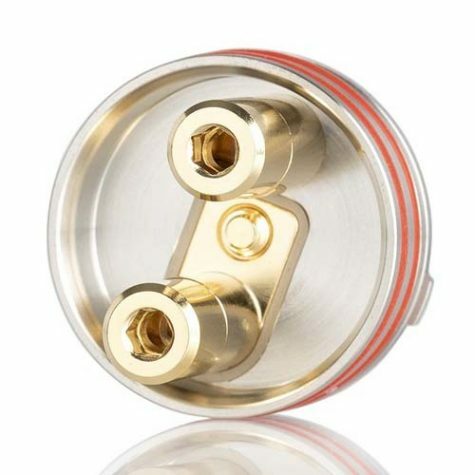 The top of the Kanger Vola is where you’ll find the spring loaded 510 connection which manages to perform a good job of forming a proper connection with the included Vola sub-ohm tank. 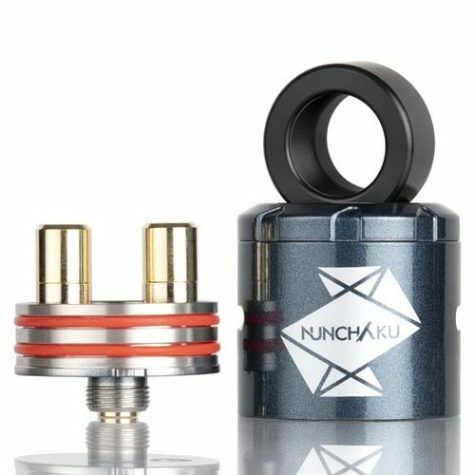 The 510 connections position is centred on top of the device making it an easy fit for most atomizers that have a base diameter of 25mm or less. 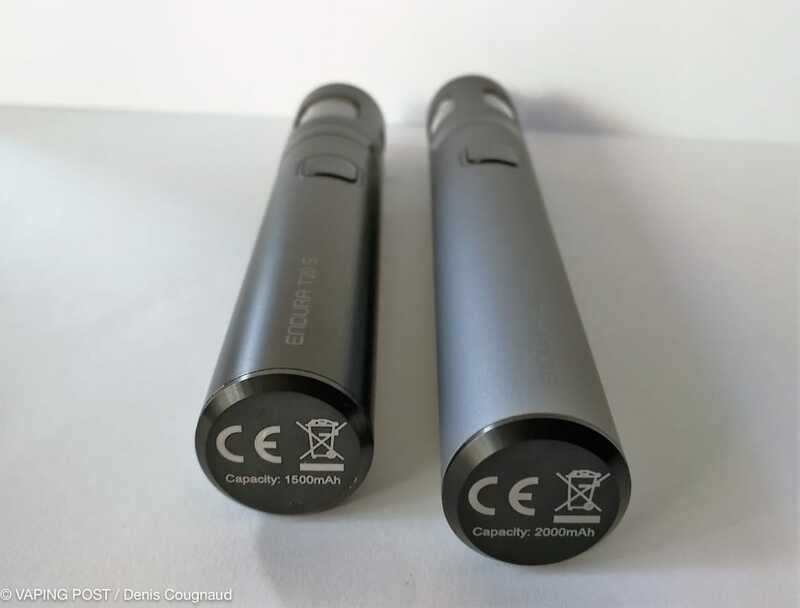 Sufficient battery venting can be found on the bottom making battery safety a non-issue and as the battery is non-swappable, there is no battery door to be found which might detract from the rigidity of the mod. The Kanger Vola sub-ohm tank included in the kit does a stellar job at creating a variable and versatile airflow system which is also easily adjustable by the user. The end result is a smooth and non-turbulent airflow when configured properly although some annoying whistling can be heard when closing off the airflow to a bare minimum. The tank has inlets for top and bottom airflow meaning cloud chasers can get their full fill of maximum vapor production by fully opening the airflow up all the way. 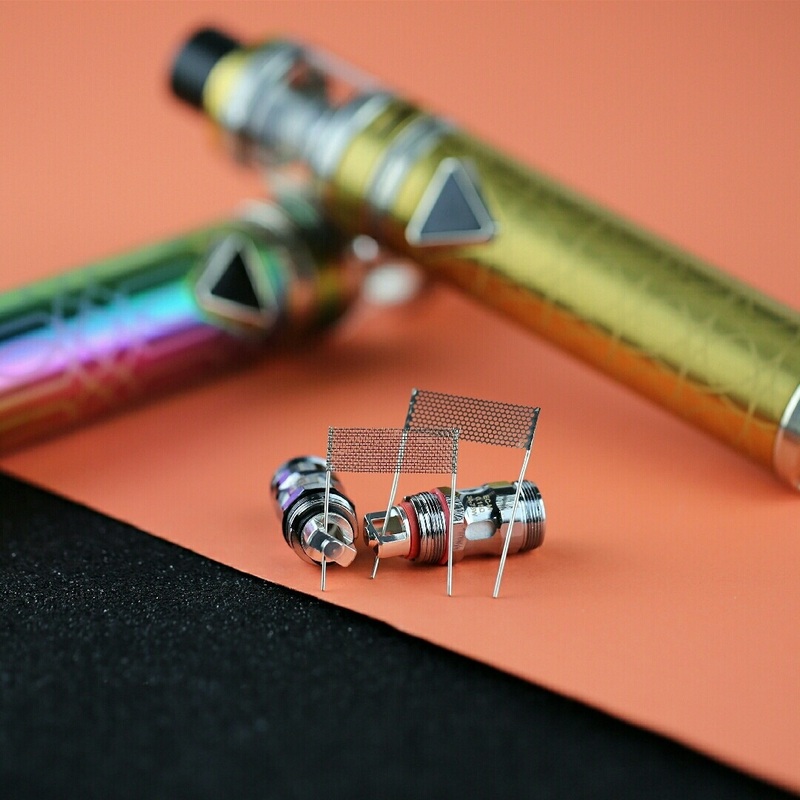 The two included coils bundled with the kit are the R2 0.4-ohm single coil rated for an output range of 40-80 watts, and the R8 quad coil at 0.2-ohms which can handle an output range of 50-90 watts. For a more relaxed vaping experience, the R2 coil does a good job of producing a decent amount of flavor and vapor while helping extend the battery life, while the R4 coil produces a more intense vape with increased amounts of flavor and vapor at the tradeoff of eating up the internal battery faster. Coil life is about par for whats expected of most pre-built sub-ohm coils and last about a week of optimal use before flavor production starts tapering off. While specs-wise the Kanger Vola isn’t a match for the true heavy hitters of the vaping world which reach maximum wattages of 200-300 watts, it’s pretty good at what it does. The 100 watts of maximum output that the Kanger Vola provides is sufficient for 90% of vapers out there. Ramp up is quick without any noticeable firing delay and misfires are pretty much nonexistent meaning you’re guaranteed a bountiful of flavor and vapor everytime you hit the firing button. When it comes to vaping modes, the Kanger Vola doesn’t fall short. Capable of temperature control for the full gamut of temperature control coils such as stainless steel, nickel, and titanium, the Kanger Vola lets vapers fire the mod on temp control regardless of what coil they prefer (with the obvious exception of kanthal). Adjustable TCR mode is also a welcome option which the Kanger Vola supports allowing power users to tweak the output of their mod to their exact specifications. Regardless of your expertise when handling variable wattage devices, the Kanger Vola manages to simplify the vaping experience for beginners. Preset modes come available in the form of a “Beginner/Intermediate/Expert vaping modes. This is done with the intention of preventing beginners from making unintentional and undesired changes to the device’s settings while giving more experienced vapers the desired flexibility that they might want from their device. The Kanger Vola tank is easy enough to refill thanks to the simple top fill mechanism which involves just threading the top cap off and dripping e-liquid down the fill holes. 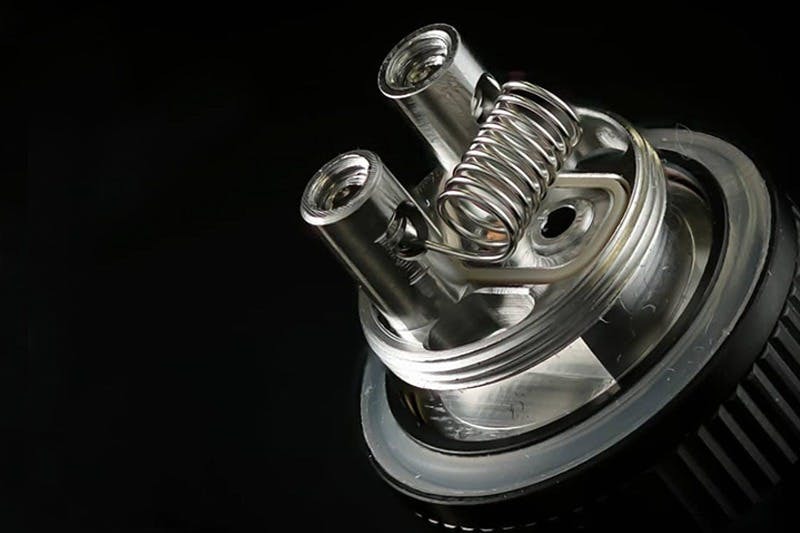 Replacing the coils is an easy affair as well; simply unscrew the tank from the base and thread off the old coil and simply swap the new coil, threading it in. The main drawback of the Kanger Vola is the rather lackluster mAh rating on the internal battery. 2000MAh might be sufficient for lower power mods, but if you plan on vaping the on the Kanger Vola at wattages north of 40 watts, don’t be surprised if your mod runs out of a charge at some point midday. This is especially more pronounced when using the included R8 coils which are rated for a low resistance which will discharge the battery at a faster rate. If you don’t mind charging your mod with portable power bank midday then this shouldn’t be an issue, but for those who prefer a kit that gets’s by on its own for a full day’s worth of use, it might be a good idea to look elsewhere. The Kanger Vola is a compelling compact option that provides a wide series of vaping options for both beginners and power users alike. Unfortunately, the minuscule 2000mAh holds back the true potential of this kit, disallowing the mod from operating at a full day’s worth of use when vaping anywhere north of 40-50 watts. 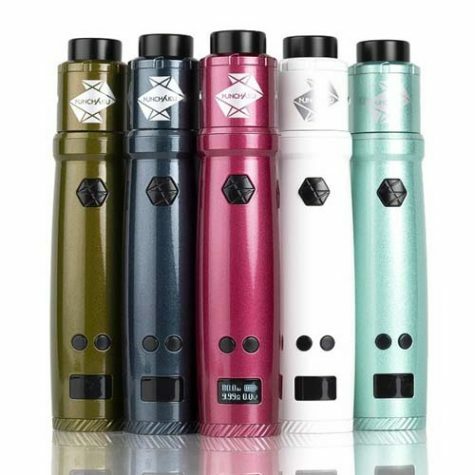 Author kittyurvapinPosted on December 29, 2018 Categories UncategorizedLeave a comment on Kanger Vola Starter Kit Review – Voila Vapor! Electronic cigarettes have undergone countless innovations through the years, from improvement when it comes to battery technology, to huge leaps in the atomizer and tank design. Notso unexpectedly, one of the things that haven’t really changed in the years is overall coil design. While we’ve had larger and more complex designs more recently, the overall concept still stays the same and that is something that the Joyetech Ultex T80 is seeking to change. With its own uniquely designed heating element, the Ultex T80 is a potential game changer within the sometimes too familiar and stale vaping space. While Joyetech never really was the kind of brand to produce top of the line, ultra-premium devices, they’re not exactly the type to cheap out on their mods either, something which is exceedingly evident with the Ultex T80. Crafted out of a solid aluminum chassis, the Ultex T80 offers a soft yet sturdy feel when held in hand. The intricate lines carved on the exterior gives off a strong lightsaber motif, especially with the grooves located near the power/fire button located close to the base of the tank. 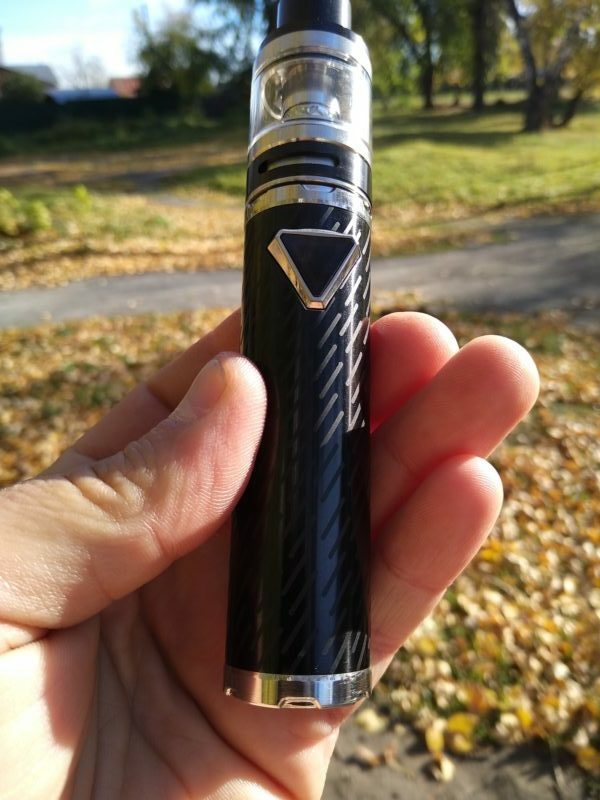 Despite its tube-like aesthetic, the Ultex T80 doesn’t share the fixed output mentality that most tube or mechanical mods often exhibit, something which becomes glaringly obvious upon spotting the up/down button wattage buttons as well as the tiny and non-descript OLED screen located close to the bottom of the device. While we’re normally quick to hark on devices that make use of a smaller than average screen, we can’t really complain in the case of the Ultex T80 as the small screen is the perfect fit for preserving the clean tube aesthetic that many fans of mechanical devices are sure to appreciate. Another characteristic that really surprised us about the Ultex T80 is the battery cap located at the bottom indicating that the device does operate with a removable 18650 battery instead of an integrated cell. The battery cap doesn’t do anything fancy, but it threads on well and holds the battery in place well enough for us to feel confident that the battery isn’t going anywhere we don’t want it to. 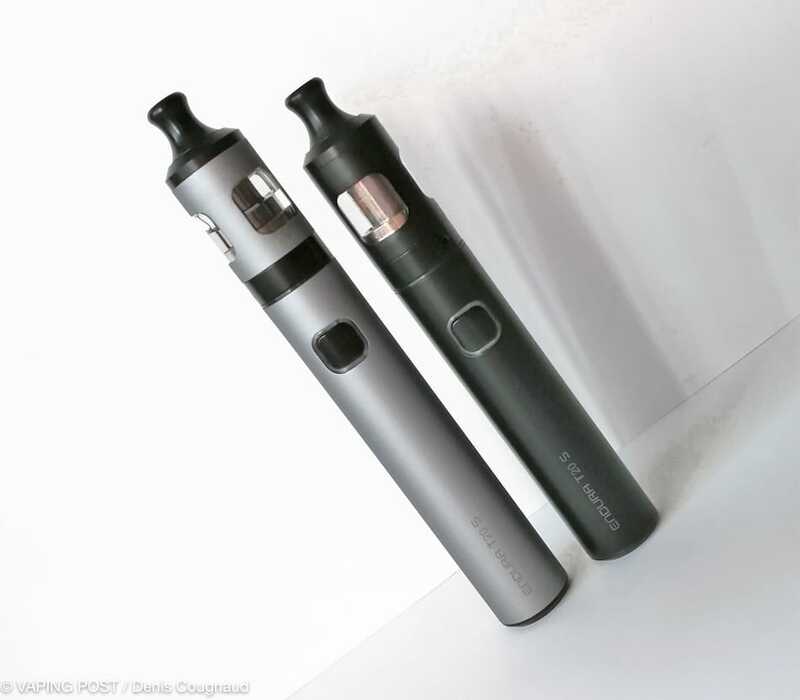 Here’s where things get a little wonky, and to be honest we feel that its to be a bit expected considering that Joyetech is basically pioneering an all-new design for a heating element. 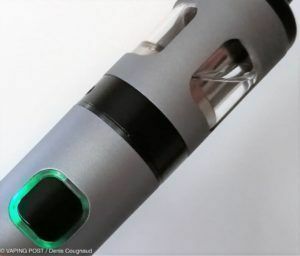 While Joyetech advertises the Ultex T80 as a “coil-less” device, the actual truth is that it still uses a kanthal heating element to vaporize the e-liquid. The main difference is that the kanthal isn’t wrapped in a coil and is instead laid out in a flat sheet or film and pressed against organic cotton which acts as a wicking agent. 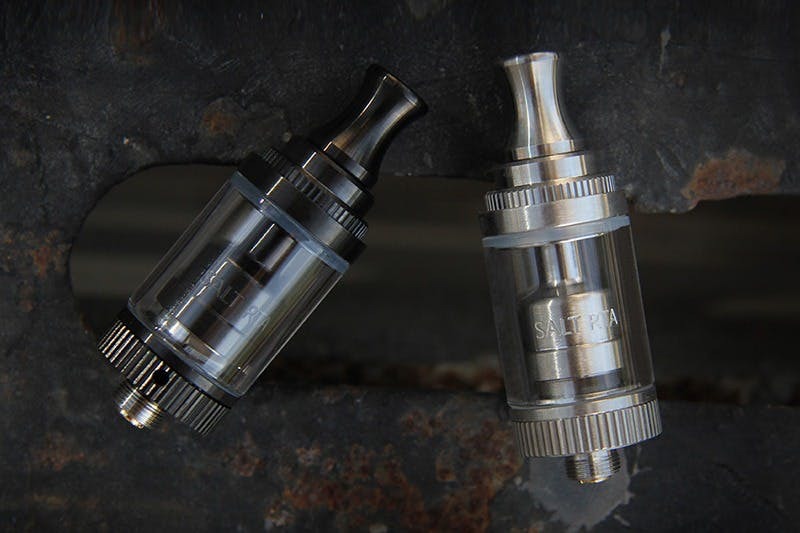 It’s a slightly different approach that doesn’t differ much from mesh coil designs, but the mechanics of how the Ultex T80 vaporizes e-liquid doesn’t really differ at all from every modern device available right now in the market. 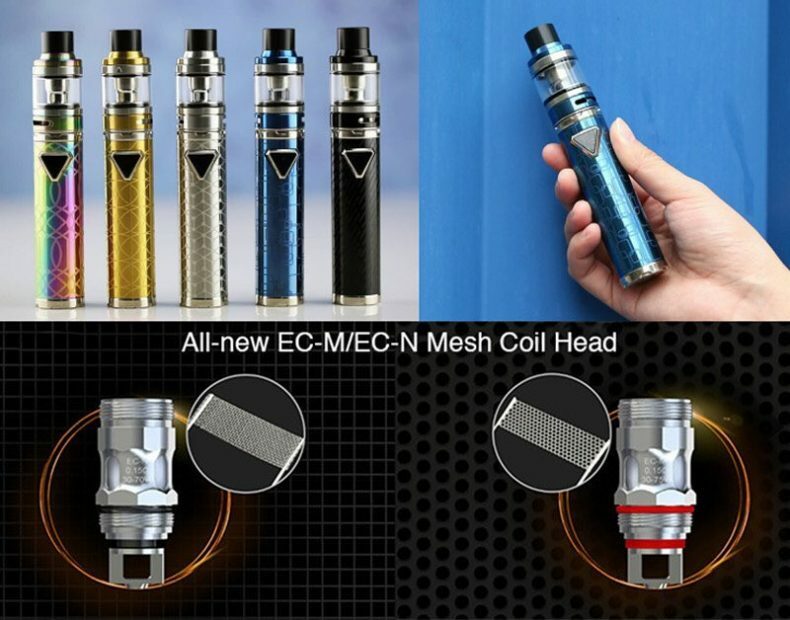 Considering Joyetech took some creative liberties with this sort of “coil-less” design, its to be expected that there will be some sort of trade-off. This definitely hold through in the airflow department as vaping on the Ultex T80 does produce some significant turbulence to the point that each inhale feels a bit whistle-y which can get a bit annoying for more particular vapers. Occasional spit back is also another issue we experienced with the Ultex T80, and we’re almost 100% certain the spit back is caused by the less than optimal airflow design causing heat to be trapped in the coil, subsequently boiling or “popping” the e-liquid to the point you can physically feel the flavor hit your lips in liquid form instead of vapor. In terms of flavor or vapor production though, the device does just fine although it doesn’t really wow us in any way. In fact, it sort of reminds us of how first-generation mesh coils performed back when they were first released so hopefully, we’ll be seeing some improvement in this regard should Joyetech decide to follow up on it. Perhaps one of the most unexpected but welcome features of the Ultex T80 is its capability for variable wattage which is rarely seen in the tube form factor category. The device fires up to a maximum of 80 watts but we stuck to Joyetech’s recommendation of vaping around the 40-watt range as anything significantly had the potential to overload the coil and produce an unsatisfying burnt taste. In the future, we’d be eager to see more variations of this coil-less design released in tandem with compatibility for larger battery cells such as 20700 or 21700 batteries. For those wondering, the Ultex does support temperature control out of the box although there’s currently no option to use it with the included tank as there aren’t any TC variants of this coil-less design being made for it yet. You’ll definitely need to vape with a 3rd party or alternative atomizer if you want to enjoy temperature control on this device. Setting up the Ultex T80 doesn’t differ much from any standard variable wattage device with a sub-ohm tank with exception to the coil-less mechanism found on the base of the tank wherein you’ll need a small Phillips head screwdriver to screw in the NCFilm kanthal heating element. As for the wick, any organic cotton will work, you’ll just need to cut it to size in order for it to fit underneath the NCFIlm. After threading everything together, simply push the top cap sideways, sliding it open in order to access the fill ports where your e-liquid of choice goes in. Hit the power button 5 times and the Ultex T80 should jump straight into variable wattage mode. Hold the fire button down while inhaling and you’re pretty much good to go! With dimensions measuring out to 28mm* 138.5mm, the Ultex T80 does sport a bit more girth than your average tube-style device which is understandable as its holding not only a complete chipset which enables VW and TC modes but an entire 18650 cell as well. 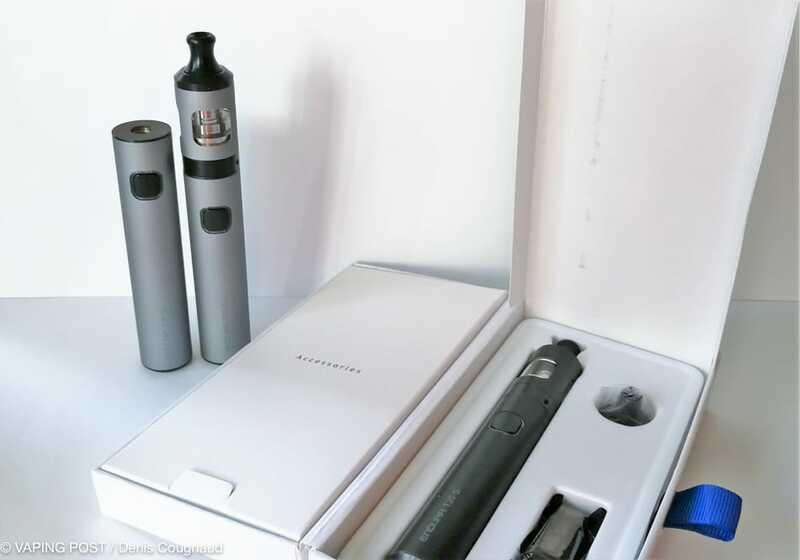 The kit in its entirety is relatively lightweight with about 200 grams if including the weight of the battery making it a solid choice for those looking for an easy to carry all day vape. As for battery life, we tested the Ultex T80 with a 3000mAh LG cell and found it to handle power delivery efficiently enough, allowing us to go for a full day of use moderate use before the voltage on the battery dropped to a point where it required recharging. The device supports 2A charging and includes a micro USB cable to facilitate that as well so downtime in between charging cycles although we strongly recommend getting a dedicated charger and a few spare 18650 batteries to take full advantage of the device’s ability to easily swap batteries at a moments notice. When all’s said and done, we have to say that while we do like the Ultex T80 as a whole, the NCFilm made us feel like we were vaping with an unfinished prototype. While beginners might not find a lot to complain about the inconsistent airflow and rampant spit back on this devices, those familiar with vaping on well-designed tanks or atomizers will definitely feel the lack of polish in the way the Ultex T80 vapes. If you are looking for the best pre-filled unit on the market we suggest checking out the Bo One and if you are looking for the best mod-style unit we suggest checking out the Smok X-Priv. Today we are getting acquainted with the reincarnation of one of the iconic devices, from which many bathers began their journey into the world of vaping, which is beautiful and pleasantly smelling, unlike analog cigarettes. So, the next “bestseller?” – Eleaf iJust 3 kit . exterior is made in a modern style, bright colors of the case, embossed engraving in the form an intricate pattern on board and, of course, a “serious” tank crowns this composition. Especially here there is nothing to burn, probably, it will be more interesting for you to see the photo. So just a few words. The complete tank is powered by new replaceable evaporators on the “grid”. However, the old can also digest. They are blown, naturally from below, to adjust the tightening provided for a slewing ring. The capacity of the tank is as much as 6.5 ml in the “non-neutered” version. Top filling – sliding cover. It turned out quite serious and impressive non-service. Landing atoms up to 25mm in diameter inclusive. The battery pack is equipped with a battery of decent capacity. It is charged through the connector at the top of the device. Fire button is large, embossed and comfortable. It is surrounded by an LED indicator, one of the functions of which is displaying the battery charge level. 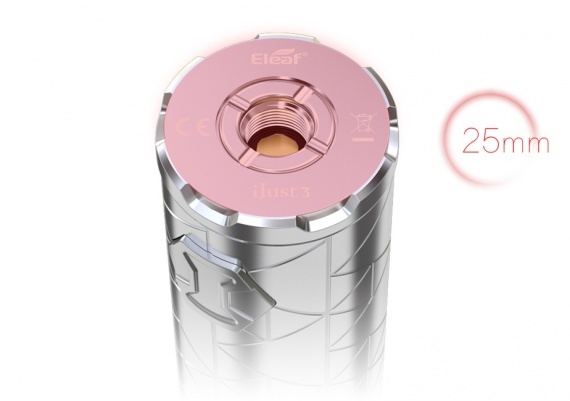 Eleaf iJust ECM – is the new Ajast better than iJust 3 or not? 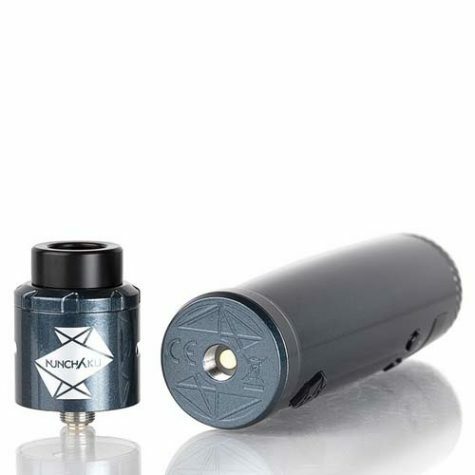 This is another starter, in the launch version with the iJust ECM Atomaizer atomizer. In the spring of this year, iJust 3 was released , which is currently the leader among its subsidiaries in sales. Will the new Ajast be better than the Ajast 3? Compare in the review. Comes starter set in a white box on which there is a stretch code to verify originality. We are met with iJust ECM Tank, a battery pack, a spare 2 ml flat glass, a ZIP package with o-rings for the atomizer and refill silicone (with a non-spill function), a white USB cable, packed in transparent plastic 0.15 ohm evaporator Scotch is a black rectangle to check the originality of the device (this scooter needs to be applied to the box, to the place where the black stripe is on the box and if it lights up, then the original vape). 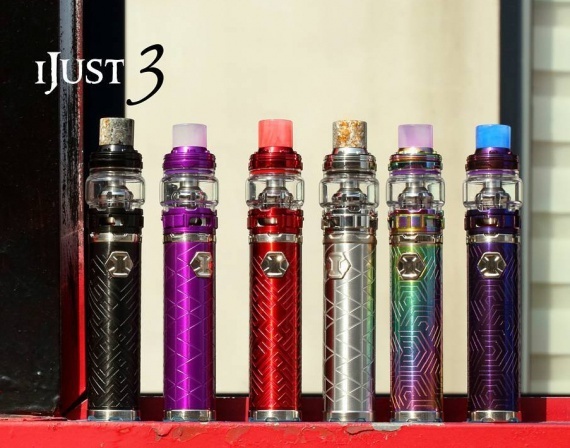 Eleaf iJust ECM is made of stainless steel and is available at the time of this writing in 5 colors: black, blue, steel, yellow and rainbow, has a built-in 3000 mAh battery, working resistance from 0.1 Ohm, equipped with only one mode – Power, has maximum power – 40 W, paired with an iJust ECM Tank on maintenance-free EC-N and EC-M evaporators. A distinctive feature is that the ajjast under consideration works on new type evaporators and, of course, on the grid: EC-N and EC-M. Both on the cantal, with a resistance of 0.15 Ohm, the cross section of the grid in two evaporators is different: larger and smaller. Electronic cigarette is presented in 5 colors so far: gold, silver, black, blue, dazzling. But let’s start as always from above and in order. 510 connector is different from the connector that stood on the third aijaste. Here on the connector is the name of the device and manufacturer. The central part has 4 propyl, which is likely to protect the atomizer from sticking to the connector when hovering. Pin springs about 2-3 mm. Next comes the button – Fire. It does not rattle, has a triangular shape, a sharp angle down. This arrangement makes it more convenient to press the button almost from the bottom. However, at the edges, pressing is also pleasant. In general, the click is not loud, the click is clear. Operating resistance: 0.1 to 3 ohms. Inside the button there is an LED that lights green when pressed. Personally, I liked the button on iJust 3 more, it was larger and had a hexagonal shape. Although it’s all a matter of habit and perhaps triangular, you can also get used to it. At the bottom is the base, which in all colors will be steel color. Bottom hole for exhaust gas from the battery and at the same time to cool the board. You can note that the connector and the base have the same cuts at the extreme points, which give a certain symmetry in design. Atomizer in Ajast 3 was somehow more elegant. In the same usual delirious 810 drip-type on two o-rings. 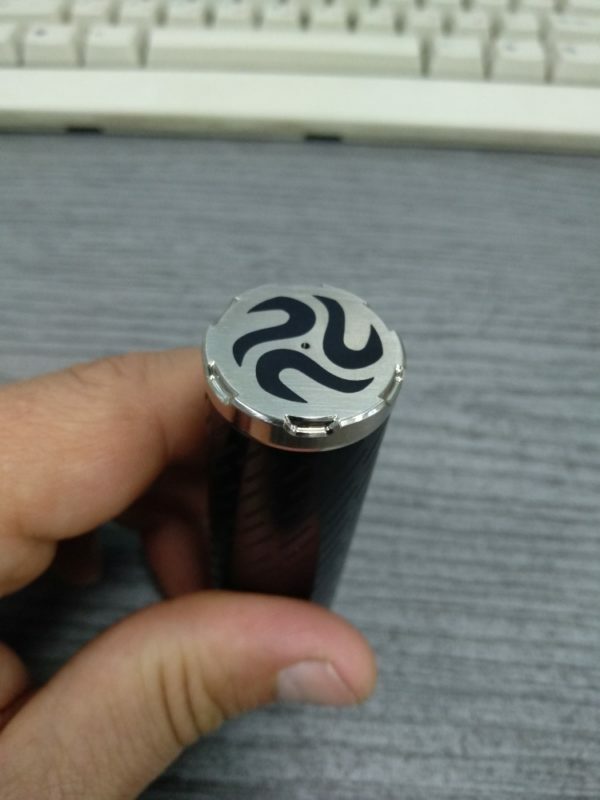 Drip-tip inside has a narrowing to the bottom. In general, he is not bad, but the aiphast driptypes of the third were from Resin and looked very nice. Refueling is carried out by shifting to the side of the refueling cap. A white silicone insert opens to fill up the fluid. There is one more in the set, with the function of non-spilling, i.e. after removing the spout of the bottle from the tank, the membrane closes the filling opening and the zizhka from the tank (if turned over) does not leak out. 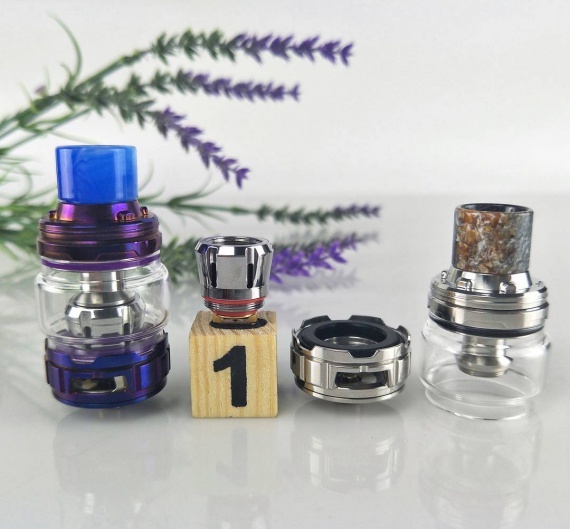 Atomizer is disassembled from the drip-type, top-cap, which is combined with the mine, the evaporator, connecting the top and bottom of the tank, base and glass. The EC-N and EC-M evaporators are threaded at the top and bottom, so they are screwed in and hold the top cap (top cover) from the bottom and top. Coils are distinguished by the cross section of the grid, i.e. only its weaving. From 30 to 70 W – recommended power. The base has a blower adjustment ring, which is smooth here. There are stoppers. Pin floating, sticks out badly and therefore cannot be used on mechanical mods. The volume of the tank is only 2 ml. It is not clear why they put exactly the same glass for 2 ml in the kit, but the volume is small. The first thing that came to mind after the review was that Eleaf was in a hurry to release a new ajast. Unlike iJust 3, ayjast ECM was not as roomy, only 2 ml instead of 6.5 on Bublee-Glass, i.e. the manufacturer refused to increase the volume of glass and it is strange. In addition, the new iJust power only 40 watts. Evaporators on the grid are delicious, but the third was tastier. There the steam was somehow richer, thick. The pair also had more on the top three, which is understandable, it was just more powerful. The button during operation is pressed normally, like the indicator light, the red glow says that it is time to charge. Three tanks on a fully charged battery can be evaporated. Still, iJust 3 is better than iJust ECM. 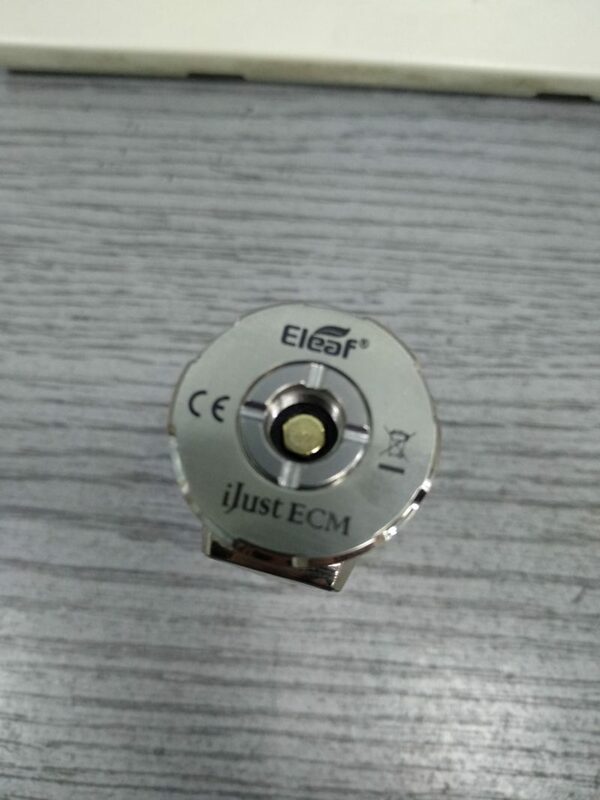 Author kittyurvapinPosted on December 24, 2018 Categories UncategorizedLeave a comment on Eleaf iJust ECM – is the new Ajast better than iJust 3 or not? The Salt by Coilart is a single-coil mouth to lung rebuildable tank atomizer. It is also the first RTA designed specifically for use with nicotine salt based e-liquids. 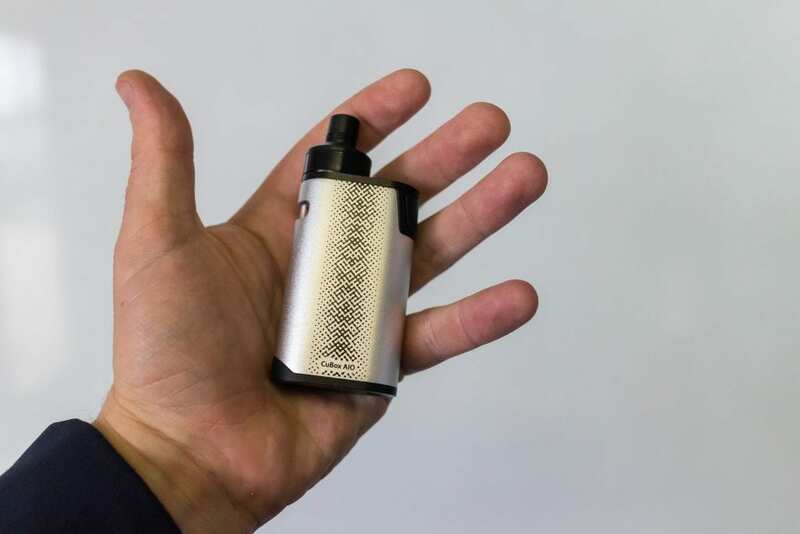 In order to accomplish that, Coilart made everything small on it: from atomizer diameter to build deck size, and from the build posts to the airflow holes. Everything about this RTA is engineered for use with higher strength e-liquid. 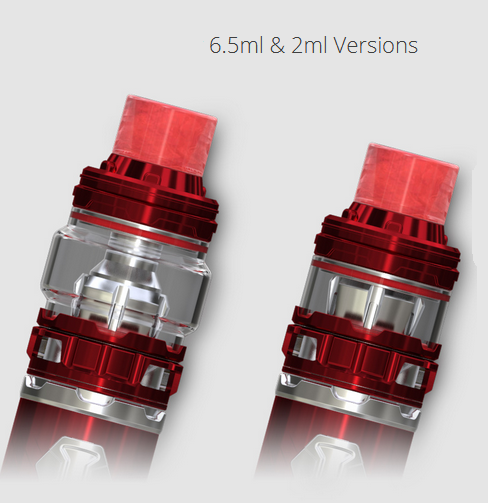 It comes with a capacity of 2 mL — that goes up to 3.5 mL with the included bubble glass – and six prebuilt coils. The coils come in three specs, each for a different kind of juice (low strength nic salts, high strength nic salts, and regular e-liquid.) Coilart lists five colors for the Salt RTA, but only the black and stainless steel editions are available for purchase right now. The CoilArt Salt RTA has a simple, retro style to it. The first thing you notice is that it is only 18 mm in diameter; it reminds me a lot of the Nautilus Mini, minus some curves. 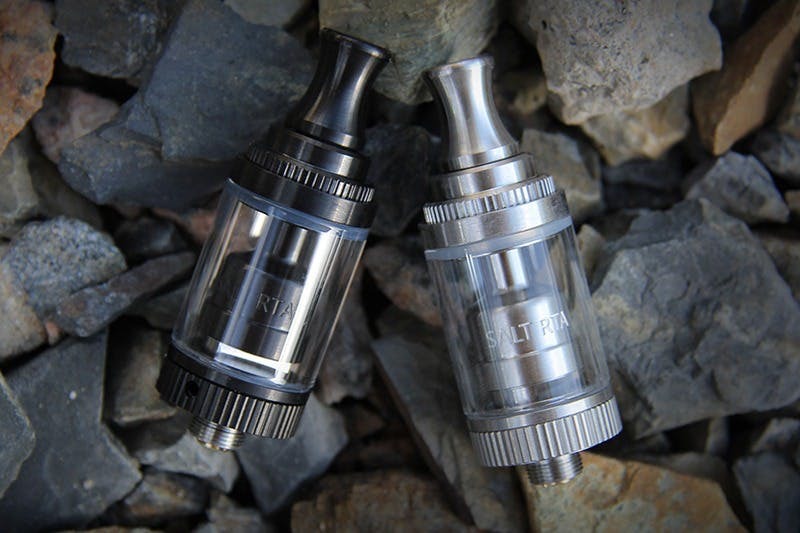 The 2 mL capacity of the Salt RTA is impressive for a rebuildable tank of its size. To put it in perspective, the 24 mm Berserker RTA holds the same amount of e-liquid out of the box. Its construction is sturdy and metallic, and I appreciated the fact that the tank section is made out of glass. It gives some stylish points to it. Machining is on point and everything seems well put together. There are some minor drawbacks though. One of the Salt RTAs I received came with a slightly worn-off gasket O-ring, but I found a replacement piece in the box, so that’s fine. And the ridges of the airflow ring might need some cleaning up every once in a while. Oh, and the replacement bubble glass that gives the Salt an extra 1.5 mL looks kinda funny on it – but that might just be me. The Salt RTA is an MTL atomizer and doesn’t pretend otherwise. It features an adjustable single hole airflow ring with seven airflow options, ranging from 0.6 to 2 mm. The ring doesn’t lock on each hole, but it does have stoppers on the smallest and largest airflow holes. The black airflow ring made it a bit hard to distinguish between the different airflow settings on the black Salt RTA, but I got used to it after a while. 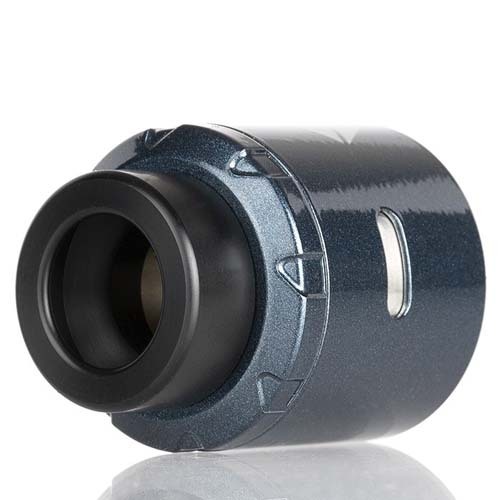 The bottom inside airflow measures somewhere between 1.2 and 1.5 mm and the tiny chamber reinforces the tight airflow of the tank. While this might not be the most innovative airflow system, everything is very well thought out. 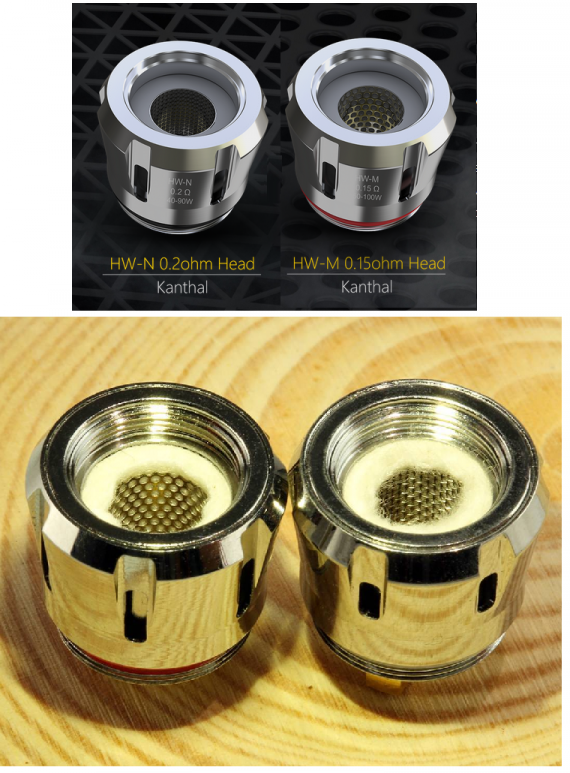 Most importantly, the external airflow options are very close in diameter to the internal airflow hole, which ensures a smooth MTL experience. Just by looking at the airflow system I could already say that this will not be a tank for those after an airy vape. It might have seven airflow options, but all of them belong in the tight draw category. The two-post build deck is simple and minimalistic. It is a slightly raised GTA-style deck and reminded me a lot of the build deck of the 3CVAPE Savour RTA — although everything is much smaller on the Salt RTA. Building on it is very straightforward: one coil end on each post, move the coil close to the airflow, wick it up, and you are ready to go. I’d suggest using coils with up to a 2.5 mm ID. The wick holes are tiny and your wicks will need some combing to ensure that e-liquid will reach the coils freely, especially if you are using high VG e-liquids. Given the size (and airflow) of the RTA, anything larger than MTL-style fused Claptons will be overkill. Regular round wire of the finer variety seems to be the best option, which makes total sense for an MTL RTA – especially one that is designed for use with nic salts. 28 gauge Ni80 (included) with 20 mg nic salts. 30 gauge Ni80 (included) with 20 mg nic salts. MTL fused Claptons (included) with 6 mg freebase juice. 26 gauge Kanthal round wire with 6 mg freebase juice. 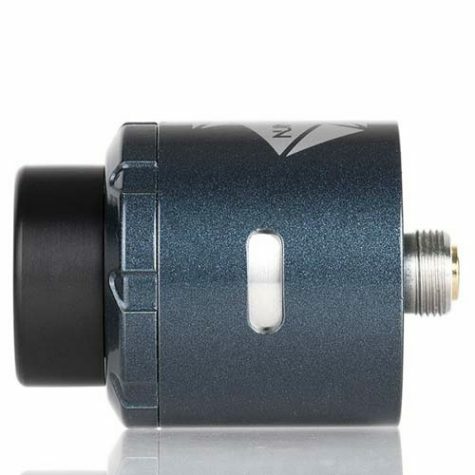 This one might be one of the smallest RTAs out there, but what it lacks in size it makes up with its performance. I got really good flavor out of all the builds I tried. The tiny chamber and bottom airflow helped a lot with the flavor and throat hit. In fact, I can say that I got comparable flavor to one of my favorite RTAs of all time, the Berserker Mini, which is not a small feat. On top of that, I had no leaking, condensation or flooding with the top-fill, some of the issues I have had in the past with various MTL RTAs. The included round wire coils were a good fit for 20 mg nic salt e-liquid. I didn’t notice much of a difference between them, especially when I tested them at the lower end of their recommended wattages. I got a very satisfying vape out of these two coils and ended up installing the second 30-gauge coil when I finished testing the rest of the builds. I am not the biggest fan of multi-strand coils for MTL vaping and I can’t say that the included fused Claptons changed my mind. They seem to be all the rage lately, but I somehow always end up having to spend time troubleshooting for gurgling. On top of that, the wattage recommendation for these coils is much higher than it should be, so keep that in mind if you use them. I spent one evening with this build and got an alright vape with the airflow completely open, but nothing special. I swapped these coils for my 26-gauge Kanthal wire and got the best out of my 6 mg freebase liquid. The airflow is smooth all over the board. At its smallest hole it is one of the tightest MTLs I have ever had — I am not vaping on high-strength nic salts, but if I did I would probably start with this airflow option. Wide open it is still MTL, but of the airy variety. I’d say it’s just a tiny bit airier than the notoriously tight Berserker Mini at its larger hole. There is no way you can use this RTA for direct-lung inhales, so keep that in mind if that is what you are after. The Coilart Salt RTA was kind of a surprise to me, mainly due to its size. I don’t know why, but I didn’t think I’d get a very good vape out of an RTA that’s so small. But I did, and I’d recommend this one to anyone after an easy to build and hassle-free MTL rebuildable tank atomizer that can perform at a high level with both nic salts and freebase e-liquid. Regardless of the liquid you plan on using with it, if you enjoy a tight MTL draw and don’t mind a smaller diameter atomizer, then you will love the Salt RTA. What do you think? Have you tried the Salt RTA? Let me know in the comment section. 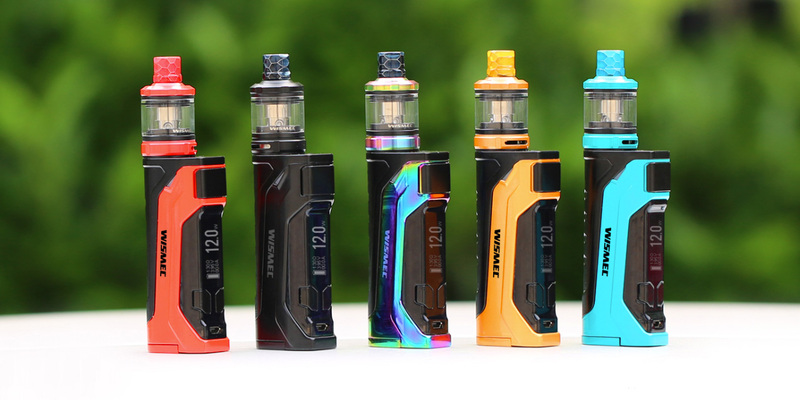 After Endura T20 in May 2017 and all EZT in September Innokin returns with an Endura T20-S more durable, more powerful with a choice of battery tubes 1500 mAh or 2000. 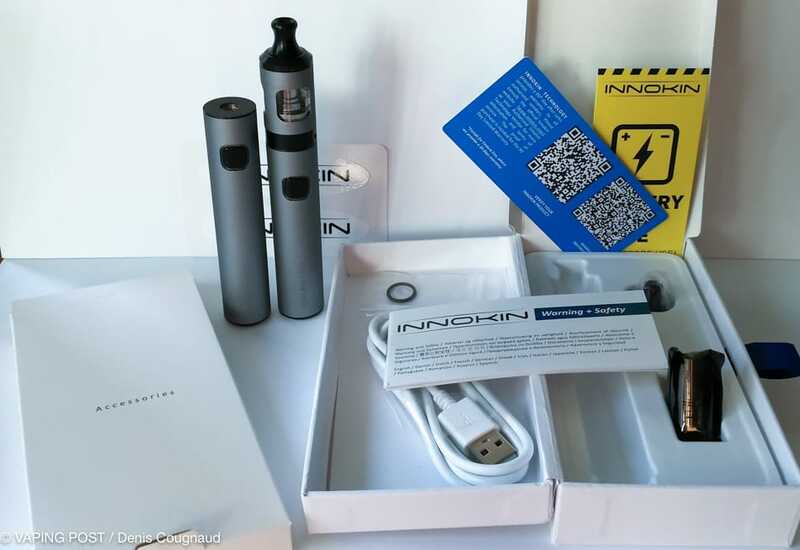 Innokin are improving its starter kits with every new feature. It must be admitted, it is easier to smoke than to vapote. Fortunately, there are products like this Endura T20-S, which try to facilitate this life-saving migration. Compared to the Endura T20 , the design does not change, but we appreciate the new soft touch coating, very nice. Like the other, the Endura T20-S offers a resistance of 0.8 ohm. This value of resistance corresponds to a product of vape all day, which must not consume too much liquid, nor overuse the battery. 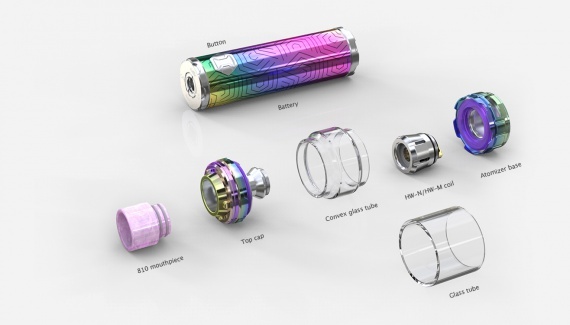 For this T20-S version, Innokin offers a choice of 2 batteries of 1500 mAh and 2000 mAh. Above all, you can buy a single battery separately. Indeed, the kit is offered with the battery of 1500 mAh, you add another battery alone, if you want more autonomy. 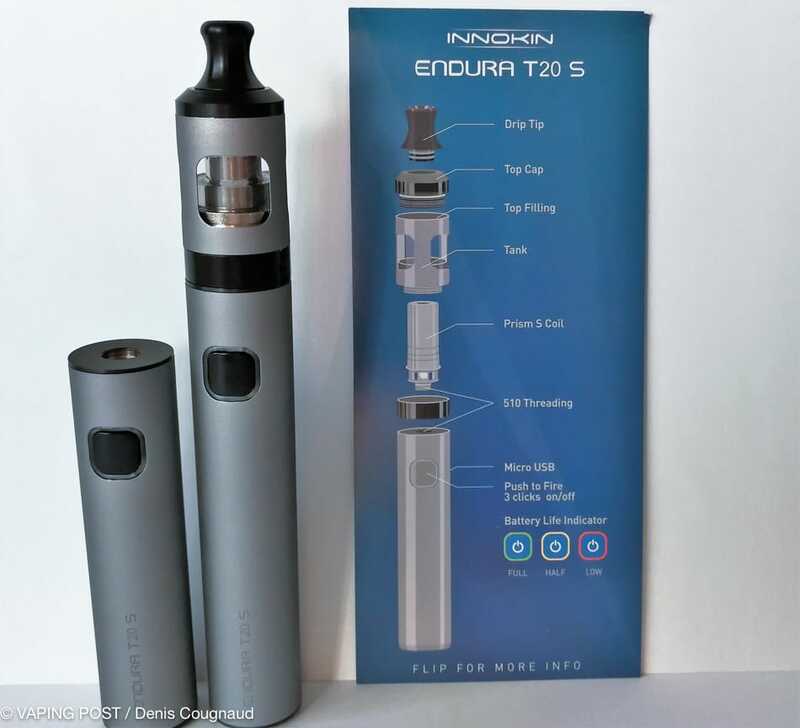 The Endura T20-S kit from Innokin consists of a battery, a clearomizer , a resistor and a USB cable. It brings together all necessary for the vape in a small footprint. 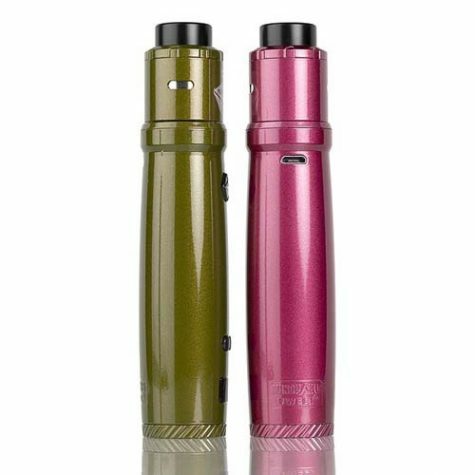 It is aimed at vapers who want to acquire something light easy to use. You can still vape with your favorite clearomizers, subject to a resistance greater than 0.6 ohm and less than 1.5 ohm. The presentation box of the Endura T20-S is small and classic like a glasses case. The whole is simple and coherent. The contents of the box is correct but without wall charger. You will find a USB cable, a spare resistor, a user manual in English, replacement seals and a replacement drip-tip. My first impression was the resemblance with the eGo ONE . It’s small, light and ergonomic. 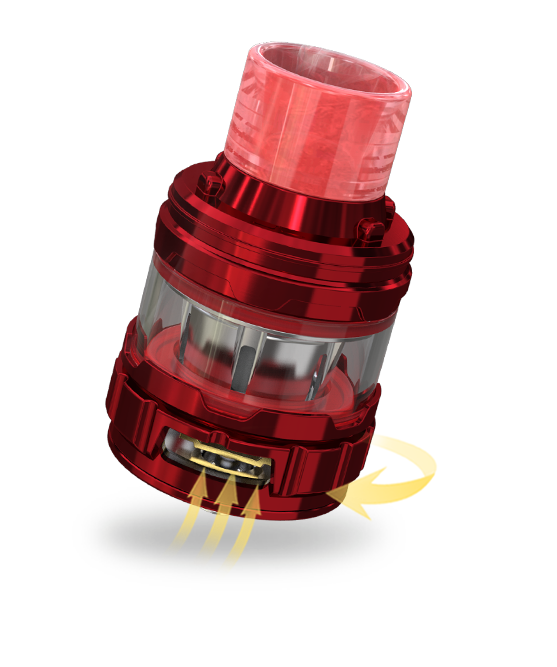 The T20-S version loses the protective cap drip tip , which was convenient to protect your e-cigarette, but was easily lost. So no regret at this level. The assembly is good, the set can easily hide in the palm of your hand or your pocket. The threads are suitable. On the other hand, look for no airflow adjustment ring there is none. This absence is also not that troublesome for those resistors that do not deserve a large flow of air. The flow rate is sufficiently low to allow a new vaper to vapot indirectly, as he generally seeks. The Endura T20-S has no adjustment . The fire button is surrounded by a thin LED that indicates the charge level of the battery. The latter barely exceeds and is therefore not easily detectable to the touch. The absence of adjustment indicates that the Endura T20-S is preset to operate resistors from 0.8 ohm to a fixed power of 18 W. Do not worry for those who already have a normal T20, the T20-S also fits 1.5 ohm resistors. These settings guarantee a significant autonomy for only 1500 mAh. This kit S is more powerful than the T20 and above all will probably fit better to a wider range of vapers. After 3 button presses, the micro LED lights up around the single button. This micro LED lights up when you are vape and shows the discharge rate of your battery . It’s not really practical and the orange comes too late. I was surprised by the red, which comes soon after the orange and only lasts a few puffs. As for the settings, you only have the fire button to vaper anything else, and between us, it’s not more complicated than a lighter. Let’s talk about the feeling of the vape. At first I could have micro risers in the mouth but it’s because I filled the tank too much , do not exceed the top of its windows. The filling is done from above by unscrewing the base of the plastic drip tip. It is convenient and quite easy and there is enough space to use most of the bottles or pipettes on the market. The only drawback comes from screwing where the liquid sometimes flows a little in the end, it is not unacceptable but an annoying hair in the long run. 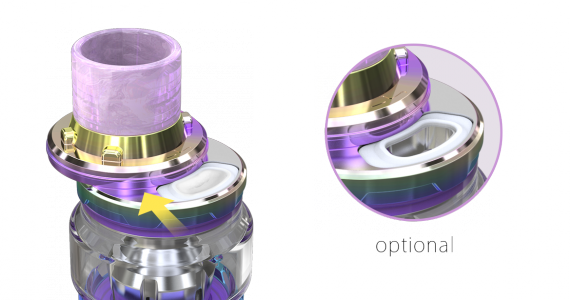 You also notice that Innokin provided 2 different drip tips, one of which is in one piece, which allows easier unscrewing for filling. Let’s add that this resistance is perfectly balanced and that naturally it consumes more liquid than the 1.5 ohm of the T20. The steam is hotter than on the T20, or even a hair too hot if we chain the puffs. I would have preferred a setting of 16 W.
The average battery life was 4 hours for the 1500 mAh version with 0.8 ohm resistance, the same as I could see with the T20 and its 1000 mAh for a resistance of 1.8 ohm. With the 2000 mAh version, I held 5 hours. In summary, I sprayed about 6 ml on the 1500 mAh battery and 8 ml on the 2000 mAh version. These averages are average work days, where I’m not hanging on this little Endura T20 all the time. It is not made to make big clouds but to make you just enter the world the vape without a nervous breakdown. Limited to 0.5 A, the recharging of the battery of 1500 mAh took me 3h30 and that of the 2000 mAh, a little less than 5 hours. It is too long ! In the book of grievances, I would also add that the end of the battery arrives a little too late. The power becoming insufficient and I could have agglutinations, sign that the liquid is not consumed enough by a weak power of the resistance. My advice is to change the battery when switching from LED to orange. It remains that this new resistance Prism never gave me a burnt taste and offers a basic vape. The taste is quite honest for this kind of material, but we must recognize that these resistances need a good break-in. The last point, always very pleasant, especially compared to the competition, is that it remains silent and easily concealable . I know that for some it is a real criterion of purchase. The choice becomes difficult between the 1000, 1500 and 2000 mAh versions for neophytes. Anyway with this kit Innokin Endura T20-S, plus the battery of 2000 mAh and a small vial of liquid of 10 ml, you will be ready for a big day of vape. And it’s essential especially for less than 150 g in your pocket. 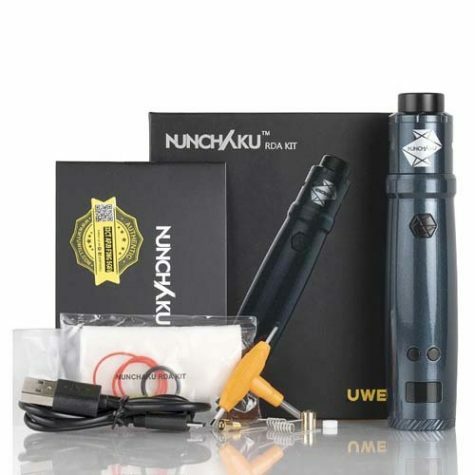 Review for the Uwell Nunchaku RDA Starter Kit – A while back, we did a review of Uwell’sfirst-ever vape mod, the 80-watt, stick-style Nunchaku… which was, by and large, a mid-range vape device shaped like Nunchucks. It was a pretty benign, but decent single-18650 offering that did more right than wrong – hardly a small feat these days. At the time, the mod surprised us because of how innovative Uwell had been with its legendary tank systems. The surprise came from how straightforward and uncomplicated the mod really was. So, it was REALLY surprising when we were asked to review the new Uwell Nunchaku RDAmod kit. Not because it improved on the device in so many ways. But rather because it did absolutely nothing to change it at all – this is the exact same mod, kids. Right down to the quirks and annoyances. When you factor in that the Nunchaku does temperature control and bypass modes, the needfor onscreen information is all the more important. While the display is clear and legible, its size and odd positioning at the bottom of the tube make it a non-factor. One area of improvement over the original Nunchaku was the MUCH improved threadingon the battery. I lamented the machining in the original review, but this updated edition seems to have sorted out the problem, so it’s not such a pain to change batteries this time around. 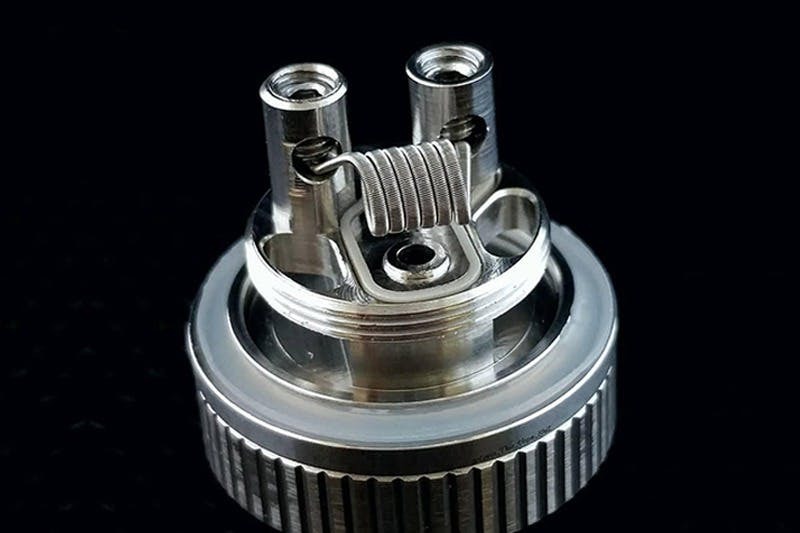 The inside of the RDA is just as low-key, with a simplistic, two-post format that makes for easy, uncomplicated building, and a pretty no-fuss experience. 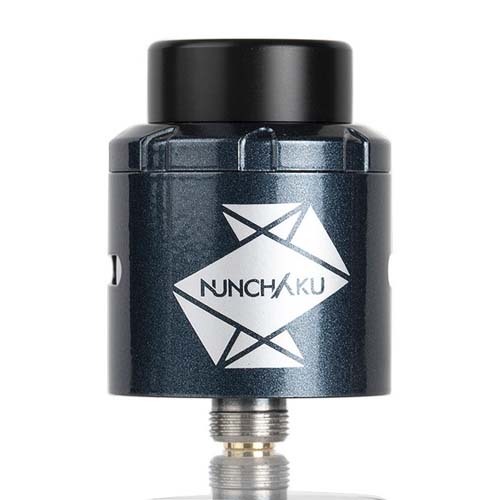 The deep juice well is forgiving for newcomers, and also creates a nice “pooling area” for those who use the included BF pinto squonk with the Nunchaku RDA. Overall, it’s a pretty solid offering. Are you going to drop that TigerTek NADA or HellVape Dead Rabbit to get a hold of the Nunchaku? Not likely, but as a complete kit, it’s a solid pairing. 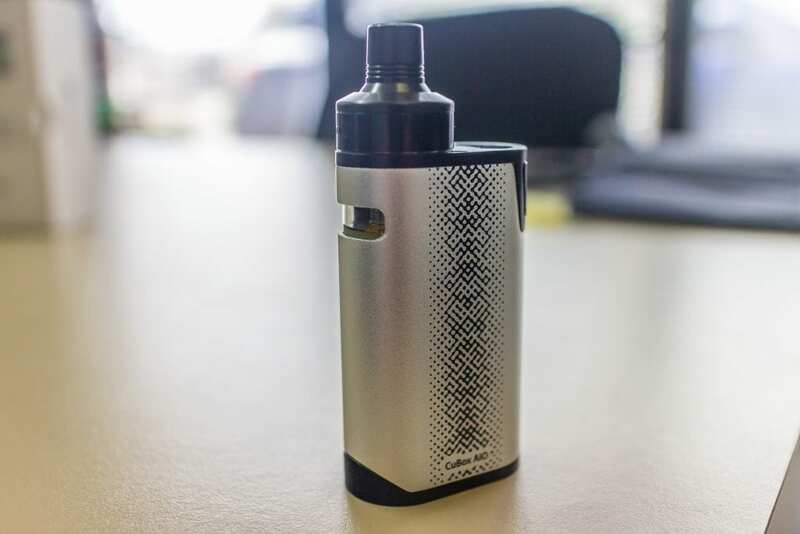 Wismec has released the CB-80 with Amor NS Pro Kit. It includes the 80-watt box mod Check Bunny and the maintenance-free Amor NS Pro tank. On May 2, Wismec introduced the new CB-80 with Amor NS Pro Kit on Instagram . Compact box mod made of zinc alloy. On the front side there is a fire button, a display, two adjustment buttons and a USB port, below. The opposite side was provided with a relief coating, for greater ergonomics. On the sides, the device was supplemented with small indicators and decorated with the device name. The bottom was equipped with a hinged battery cover. The device is powered by one 18650 battery. A USB port is provided for charging and updating the firmware. In addition to the mode, the board supports bypass and thermal control. The maximum power is 80 watts. Also, developers note the fast response of the device, amounting to 25 ms. The top of the tank is decorated with cellular driptip. It is fixed on the sliding topkep, under which the filling hole is hidden. Bottom is the adjustment ring blowing. The volume of the tank is 2 ml. The tank works with replaceable evaporators of the WS series, among which there are MTL options. 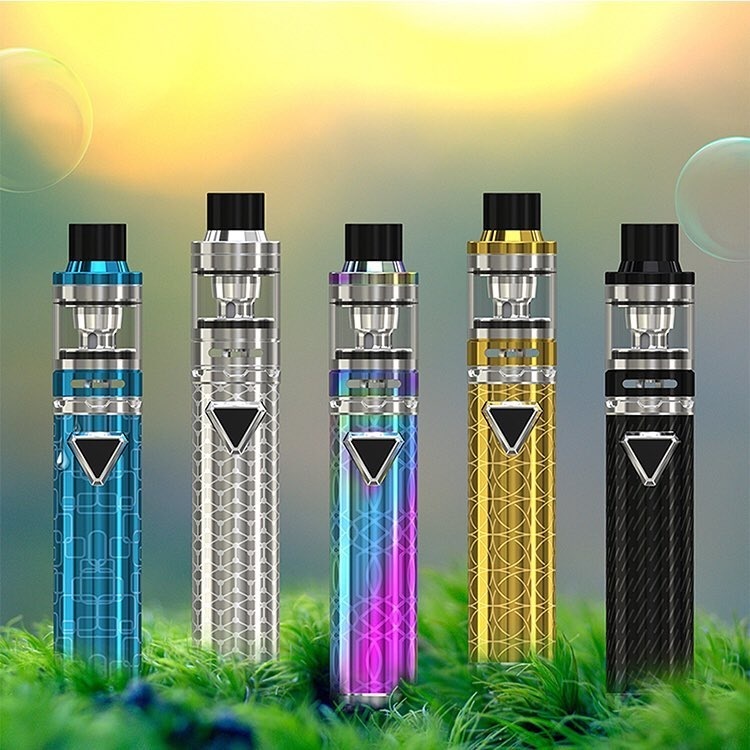 The Joyetech Cubox AIO is an all-in-one starter kit which features a 2000mAh internal battery and integrated atomizer with a 2ml e-liquid capacity. It adopts an anti-leaking structure with top fill and top airflow control systems. 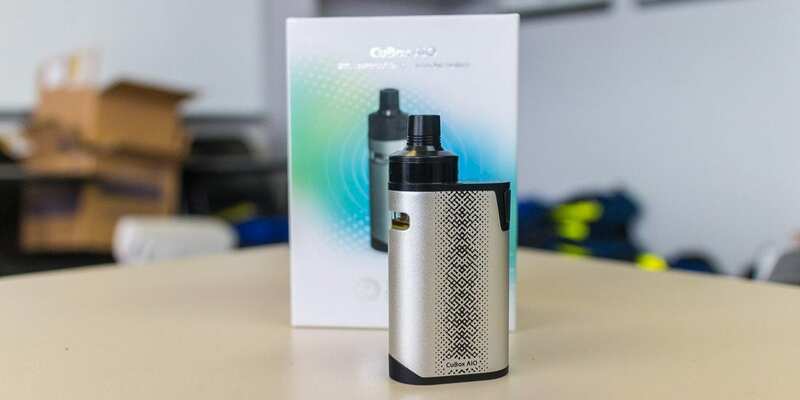 The Joyetech Cubox AIO utilizes the ProC-BF series of coil heads which is aimed at MTL (mouth to lung) vaping enthusiasts. It is available in five finishes and features quick 2A charging via micro USB. The packaging that the Joyetech Cubox AIO comes in is very true to the Joyetech line. It is predominantly white with a colorful product picture on the front and the usual specification write up on the back. The box is two tiered with the mod sitting in a nice protective foam insert on the top level with the accessories underneath. The packaging is also sealed air-tight and nothing has a chance to be damaged in transit. Upon opening the box I was very surprised to see how small this kit was in comparison to the size of the box. It is tiny! The whole thing can be covered in the palm of one hand – talk about stealth mode. The Joyetech Cubox AIO looks really good and is super compact. The build quality and overall general impression of this kit are top notch. It is very light and very cute. In no way does it look cheap or flimsy, I think Joyetech have really met their design brief here. There is nothing overwhelming about the Joyetech Cubox AIO at all. It appears very simple and I believe it will also be very simple to operate. There are no displays, screens or selection buttons to be found. 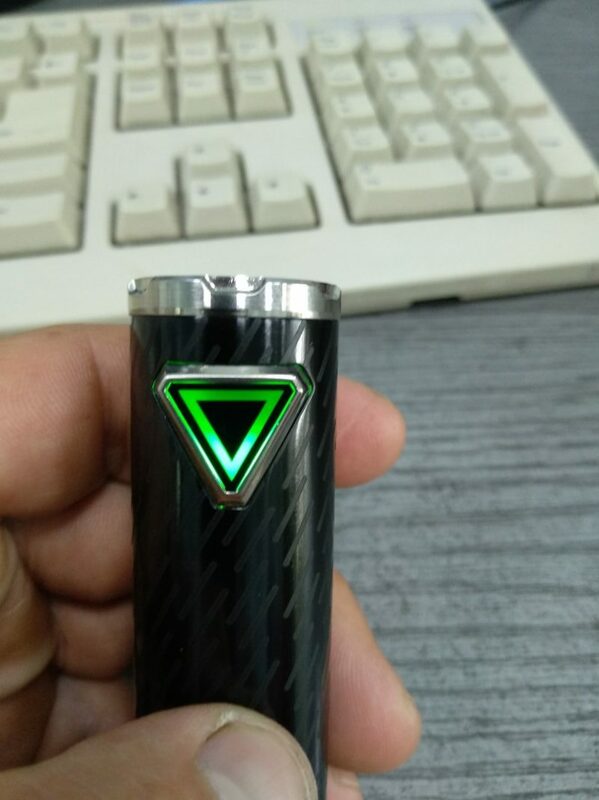 There is a nice, clicky and responsive fire button on the top of one of the curved sides of the mod. And the fire button does not rattle at all either – a definite pro here. On the other side there is a clear window so you can sight the remaining e-liquid in the reservoir. The reservoir also features a light that illuminates when you fire the mod, so you can see your juice level in low light situations. Other features of the Joyetech Cubox AIO are a micro USB port on the face of the mod and battery vents on the base. On the top there is a bank of 5 LEDs that illuminate to indicate the remaining battery level. The incorporated atomizer sits atop the mod and is fed from the internal juice reservoir. 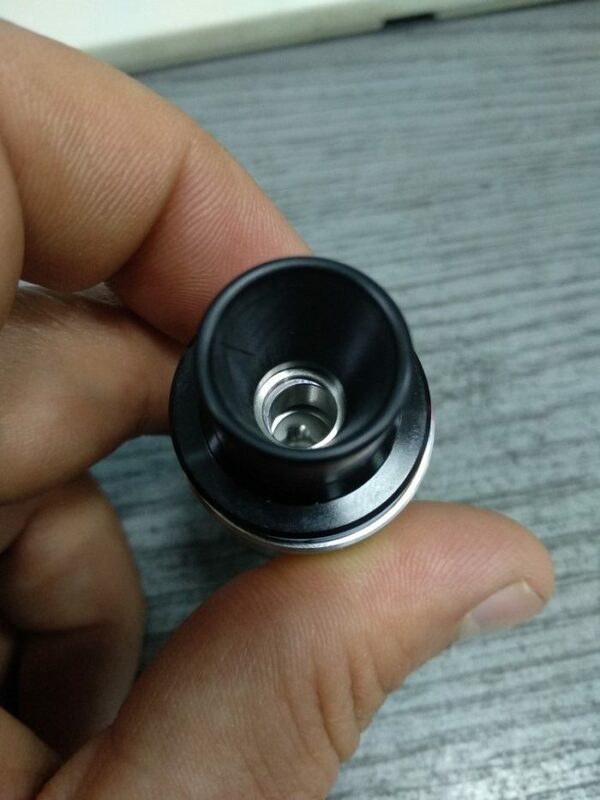 The topcap has the drip tip included and screws off to reveal the fill ports. The chamber also unscrews to facilitate coil installation and cleaning of the juice reservoir. There is an adjustable airflow around the chamber of the atomizer, which has four airflow holes. Overall the look and feel of the Joyetech Cubox AIO is wonderful. The build quality is high and quality control rings true with this one. To charge the Joyetech Cubox AIO, simply plug in the micro USB cable. The indicators will light up to confirm charging is in progress. When the lights go out, charging is complete. 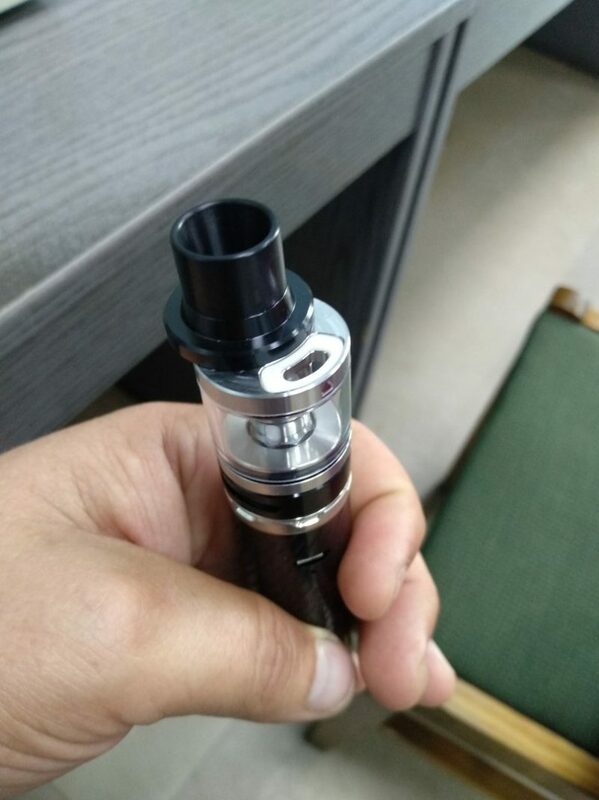 In order to install the coil, you need to unscrew the chamber of the atomizer. Then you need to screw the coil into the top cap and re-install back onto the mod. Remember to add a few drops of e-liuid onto the coil before installing. This will help prime to coil and avoid any dry burning. Once the chamber is back on the mod it is time to fill up the reservoir. This time you need to unscrew from the drip tip and the top cap section will come off. This will expose the fill ports. You can fill up to 2ml of e-juice into the Joyetech Cubox AIO from the top. This, by the way, also helps keep within TPD compliance levels. Screw the top cap back on and you are ready to start vaping. To turn the Joyetech Cubox AIO on and off, simply press the fire button 5 times in quick succession. 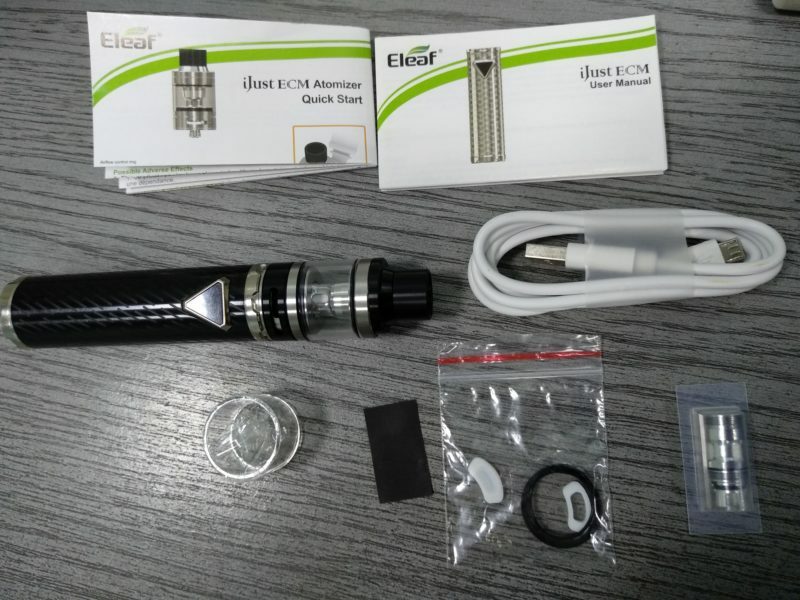 The battery indicators and reservoir lights will turn on to signal the device is ready for vaping. Over the time of using the device, the 5 LED will slowly go down to indicate where the battery voltage is. Obviously the less lights that are on indicate the less voltage is left in the battery. You can monitor the level of e-liquid by looking through the clear indicator to the juice reservoir. This will also illuminate when the fire button is pressed and stay lit for a few seconds afterwards. A very handy little addition on Joyetech’s behalf. That’s it! As I mentioned earlier, no screens, no selection buttons, no fiddling and no frills. It really is as simple as that. I have to say that this little kit is a top performer. It is ticking many boxes for me and Iâ€™m sure it will for those who try it as well. The taste off the Joyetech Cubox AIO is pretty good for such a small unit. It’s definitely geared at MTL vapes where vapor production is not a key desire. The draw on this is great for those backed off restricted mouth pulls that really help to mimic the experience of smoking an analogue. There is little to no break in time if you prime the coil properly before using it. The taste does start to get better once you break it in a little. After filling up the reservoir, there can sometimes be some gurgling present, but this dissipates after a few more tokes. Don’t expect to be able to chain vape on this in quick succession. If I take too many puffs in a short amount of time, the coil does start to taste a little dry. Not a full on burnt dry hit, however just a reminder that these coils can take a while to re-wick. I would have liked to have tried it on a thinner viscosity juice, however I didn’t get the chance – so that may be the savior here. Battery life is pretty good. The 2000mAh battery should get you through most of the day. The saving grace here is because it is such a small battery, it is quick to charge especially if you use a 2A power supply. I did not experience any mis-behavior or unexpected operations while testing the Joyetech Cubox AIO. I can say that portability is definitely not an issue. This thing it tiny and takes up little to no room where ever you decide to stash it. In your pants pocket or your shirt pocket – this will not be felt and you will hardly notice it is there. The Joyetech Cubox AIO is very, very discrete when out and about and certainly will not draw any attention. All in all a very satisfying, portable little start kit which performs really well for the price point. I am really impressed with the output from this little Joyetech Cubox AIO kit. It certainly will please anyone looking for a compact little kit to satisfy those sneaky MTL tokes. It would work as a back up, as a starter kit or as a tool for those looking to make the switch from smoking to vaping. It really is a versatile little kit and you cannot go past the price point. I would totally recommend the Joyetech Cubox AIO starter kit to anyone who is interested in trying one out. You will definitely find a place in your vaping agenda for this one, no matter your style. I hope this has helped you on your quest to find your next starter kit. Please leave any questions or comments below, we appreciate hearing from each and every one of you.